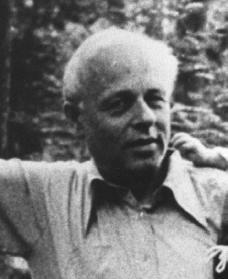 Andrei Sakharov was one of the Soviet Union's leading physicists and is regarded in scientific circles as the "father of the Soviet atomic bomb." He also became Soviet Russia's most prominent political dissident (a person who holds political views that differ from the majority) in the 1970s. Andrei Sakharov was born in Moscow, Russia, on May 21, 1921, the oldest of two sons. He was also part of a large family. When he was growing up, four Sakharov families shared the same apartment building. His father taught physics, the branch of science that examines matter and energy, and how they work together. He would take young Andrei to his laboratory and show him experiments. Andrei was dazzled and began performing his own experiments at home. His father encouraged him and gave him the desire to find fulfillment in his work. Sakharov studied physics at Moscow University. During World War II (1939–45; a war fought mostly in Europe between the Axis—Germany, Italy, and Japan—and the Allies—led by the Soviet Union, Great Britain, France, and the United States) he served as an engineer in a military factory. He met Klavdia Vikhireva, a laboratory assistant, and they married in 1943. The couple had three children. In 1945 Sakharov entered the Lebedev Institute in Physics where he joined the Soviet research group working on atomic weapons. He wrote many scientific articles and his achievements were recognized throughout the world. In 1953, at the age of thirty-two, he became the youngest person ever elected to the Soviet Academy of Sciences. Between 1950 and 1968 Sakharov conducted top secret research on thermonuclear weapons. Thermonuclear weapons release destructive energy by fusing the nuclei (the dense central cores) of atoms under high temperatures. He was named "Hero of Socialist Labor" in 1953, 1956, and 1962. He also developed a strong awareness of the dangers of nuclear testing activity and the irreversible consequences of nuclear war. In the late 1950s Sakharov sent many letters to Soviet leaders urging them to stop nuclear testing. He also published several articles in Soviet journals arguing against continued nuclear testing and the arms race. His views apparently carried weight with Premier Nikita Khrushchev (1894–1971) and others, and influenced the Soviet decision to sign the first nuclear test ban treaty in 1963.
he and other dissidents stood vigil (watch) at trials of those arrested for protest activities. While standing vigil at a trial in 1970 Sakharov, who was then a widower, met Elena Bonner. They later married, and she became his strongest supporter. At this time Sakharov published his best-known and most persuasive and forceful political essay, Reflections on Progress, Peaceful Coexistence and Intellectual Freedom. In it he urged cooperation between East and West (primarily the Soviet Union and the United States), civil liberties, and an end to the arms race. Following the publication of Reflections in the West, Sakharov was removed from most of his scientific projects and dismissed from the Soviet Atomic Energy Commission. It soon became difficult for him to publish scientific works. For a time, Sakharov was protected from being arrested because of his international prestige as a nuclear physicist, and his specific knowledge of the Soviet Union's nuclear weapons program. Toward the end of the 1970s Sakharov became increasingly alarmed about the Soviet arms build-up, which he saw as a reflection of aggressive plans. He frequently expressed his thoughts to foreign reporters and many of his views were printed in the West. His outspoken criticism of the Soviet invasion of Afghanistan in late 1979 led to the banishment (forced exit) of Sakharov and his wife to Gorky, a small city two hundred fifty miles east of Moscow. He was cut off from open contact with friends and colleagues and constantly harassed by the KGB (Soviet secret police). In 1983 Sakharov reportedly considered leaving Soviet Russia but was refused because of his knowledge of Soviet state secrets. On several occasions he engaged in hunger strikes (where someone refuses to eat as an act of protest) to call attention to continued threats against him and his family. In 1983 U.S. president Ronald Reagan (1911–) proclaimed May 21 National Sakharov Day in recognition of his courage and his contribution to humanity. Sakharov was detained in Gorky for almost seven years, released at last by Premier Mikhail Gorbachev (1931–) in 1986. In 1989 he was elected to the newly formed Soviet legislature. The remaining three years of Sakharov's life were spent traveling abroad. He died of a heart attack on December 14, 1989, in Moscow. Sakharov received the Nobel Peace Prize in 1975 for his work for nuclear disarmament and his outspoken criticism of human rights violations everywhere. He was for many, inside the Soviet Union and out, a noble symbol of courage, intelligence, and humanity. Part of his obituary said, "Everything [he] did was dictated by his conscience." Bonner, Elena. Alone Together. New York: A. A. Knopf, 1986. Lourie, Richard. Sakharov: A Biography. Waltham, MA: Brandeis University Press, 2002. Sakharov, Andrei. Memoirs. New York: Alfred A. Knopf, 1990. Sagan, Carl Salinger, J. D.